From the quaint to the eclectic, these are the dreamy spaces inspiring us right now. Consider it the ultimate escape. The space where we spend a good chunk of our days in, albeit most of said time is when we’re asleep. Our bedrooms are the one spot in our home we can personalize to our tastes, without having to compromise on a neutral-based scheme that will appeal to not only the entire family but visiting friends as well. From the plethora of cozy textures, which undoubtedly play a role, to the more unique accents that help personalize the space, our bedrooms stand in as a true representation of our styles. With this in mind, we gathered the spaces that truly inspired us all year, the one-of-a-kind rooms that emulated the personalities of those who called it home. Ahead, the best bedrooms 2017 had to offer. Joyce Lee’s bedroom redefined all of our design goals this year. From the muted palette, which was anything but snoozy, to the thoughtfully curated decor accents—handwoven pillows, indigo-dyed fabrics, and a hammock from a trip to Panama that hangs above the bed—there were no shortage of moments that shined. If this wasn’t the quintessential personification of the millennial pink trend, we don’t know what was. From the colored walls, and matching bedding, to the dusty lilac ceiling paint, there wasn’t a lack of vibrant details in this charming bedroom. Complementary layers of bright orange and soothing blues imparted the space with a dynamic feel, without feeling too overwhelming. Hilton Carter’s plant-filled home was seriously one for the books. Boasting over 140 vibrant greens, the former cotton mill-turned-loft came with no corner unmarked by a plant—the bedroom with a canopy of palms being no exception. Carving out a spot for the little ones, which they can seamlessly grow into later on in life, is a major challenge from a design perspective. In this Williamsburg rowhouse, the family did just that, filling the space with a handful of charming details—patterned window treatments, a playful rug, shelves lined with an array of picture books—which could easily be swapped out when the time came to. Whitewashed minimalism takes on a whole new meaning in this charming, attic bedroom. Scattered pops of vibrant colors and a modest mix of bold patterns impart the space with a major dose of personality. This one is definitely for the dreamers. Can you imagine a more perfectly decorated spot for the kids? From the bright dose of primary colors to the intricate prints and patterns that fill the space, this NYC-based bedroom served up a major dose of style. One of the (arguably) more notable design moments? The deep blue that marked the array of moldings. Is it just us or was this saturated blue made for the little ones’ room? Coupled with the coolest wall-to-wall bunk bed installation and an ultra rad, plaid flooring design, this sweet spot is about as colorful as it gets. Nothing packs a bold punch quite like a vibrant wallpaper, and this particular one may take the prize for fearless decorating. We love how the blue color from the print is incorporated into the bedding and complemented by the orange lamp on the side table. This 1920s storybook home comes with a long history and homeowner Kate Davison wanted to preserve that charm when it came to the remodel. For the bedroom, she kept accent pieces to a minimum and instead opted for a cozy gallery wall to keep the space’s character at the forefront. This 70s-inspired room is anything but dated. Stylist Anne Sage brought in eclectic pieces and stuck to one color palette when designing this bedroom to keep it feeling fresh and sophisticated. Proving that you don’t need a bedframe for a put-together room, Dan Pelosi styled his Brooklyn apartment with an eclectic mix of prints and colors. Featuring greenery, layered rugs, and plenty of natural light, Pelosi’s bedroom nails that perfectly-imperfect vibe. Our spring cover star Jessica Walsh balanced her love for bright primary colors with a cleaner scandinavian style for her bedroom. We love the glass divider in lieu of a standard wall that makes the space bright and airy. The guest bedroom in this LA home is just as open, bright, and modern as the rest of the house. Using subdued, cool shades and minimalist (as in, almost non-existent) decor pieces, the bedroom instantly feels relaxed. A deep blue-green wall color emphasizes the crisp white sheets and makes a dramatic statement in this tiny bedroom. The lightbulb chandelier lends a modern feel to the room, keeping it chic while also not taking up much-needed space with bulky floor lamps. Conversely, if you don’t want to commit to statement walls, make another part of the bedroom pop instead. This space is a lesson in mixing prints from the mustard yellow rug to the playful bedding to the abstract art piece hanging above the bed. 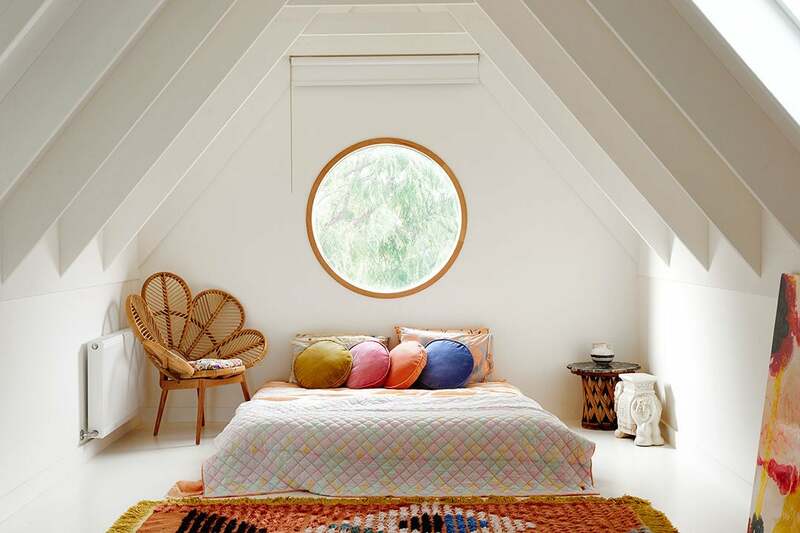 Textile designer Aelfie Oudghiri definitely brought her signature style to this fun and quirky room. Inspired by the peach tones in the wallpaper and the print hanging across the bed, the design of this bedroom is modern and fresh with a warm and cozy twist. The space, which doubles as a home office, makes good use of the natural light by including plants wherever possible. Designers Brandon Quattrone and Mat Sanders had California-cool in mind when designing this space (even more impressive when you consider that it isn’t even part of a real home; it’s a showroom!). The bedroom decor effortlessly fuses modern simplicity with a timeless color palette to create a “room” that’s both casual and chic. OK, so it’s not exactly a surprise that the Ritz Paris has impeccably-designed, uber-luxurious bedrooms. But with some carefully-sourced vintage furniture, luxe bedding, and maybe a statement light fixture like this chandelier, you can bring some of that elegance to your home at a more affordable price. Jessica Hendricks Yee chose a shade inspired by the desert and her Palm Springs wedding for her bedroom walls to make the room feel “soft and serene”. Paired with tribal-printed accessories, the whole space is a calming oasis. Originally published May 2017. Updated December 2017.